We all have that friend—or maybe we are that friend—who shows up to work in the morning with one eye twitching and a strong cup of coffee in hand. When regular drip isn’t enough, we up our dosage to a double shot of espresso and brace ourselves for the wakeup call. 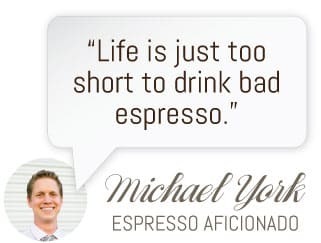 But at a certain point, every coffee drinker has yawned tiredly and wondered: does espresso really have more caffeine than a normal cup of coffee? In Italy, where espresso originated, the standard serving size is 25 ml. Most liquids in the United States are measured by the fluid ounce, so we should note that 25 ml is equal to about 0.8 fluid ounces. That’s less than a mouthful for most people. It makes sense when we consider the culture surrounding espresso in Italy. There, an espresso is appropriate at any time of day, and usually comes after a meal. It is considered a pick-me-up, either something to be sipped among friends, or taken during a moment of quiet, as a break from a hectic day. But as we’ve already established, espresso in the United States is perceived a little differently. The standard serving size of espresso in the United States is the double shot, aptly named, as it is approximately 2 fluid ounces. Have you ever heard anyone say that espresso doesn’t seem to affect them? That’s probably because they’re used to drinking much larger amounts of drip coffee. The standard café or medium-sized coffee mug holds approximately 12 ounces of coffee. This is the Starbucks “tall,” their second smallest cup size after the 8-ounce “short.” Essentially, if you’re drinking a 12-ounce cup of drip coffee, you are consuming six times as much liquid as a standard espresso. Yet people will still point to espresso as the stronger of the two. 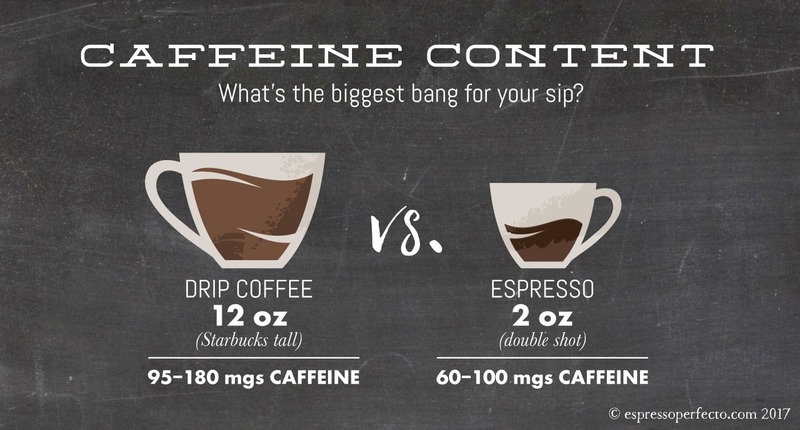 They’re not wrong: it all has to do with the fact that the brewing process and overall concentration of each drink determine the final caffeine content of the beverage. Drip coffee refers to the process of pouring hot water over coffee grounds, while a paper filter prevents the grounds from falling into the coffee. 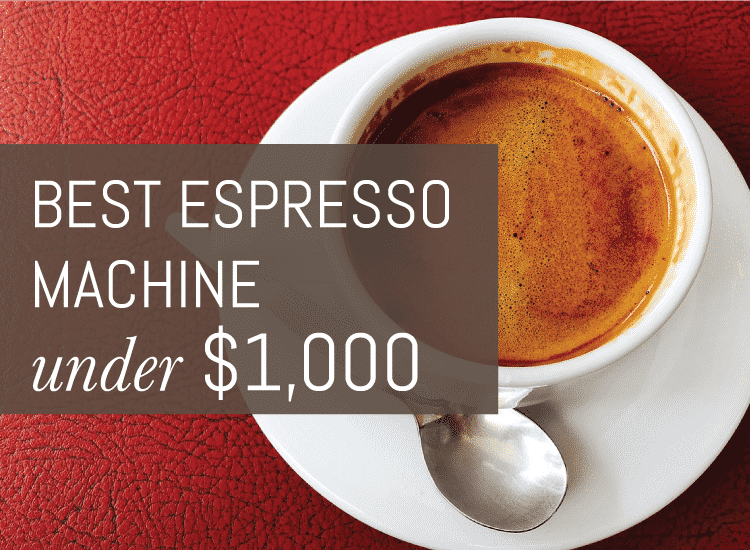 It’s the bread and butter of the coffee world, and there are coffee-making machines in almost every home, office, and college dorm room in North America. Espresso is like drip coffee’s much more intense little brother. In espresso, the hot water is forced through grounds under extremely high pressure. The grounds are also much finer than that of drip coffee (more on this later! ), which makes a huge difference in the overall concentration of the final product. What we’re looking at in these two different brewing methods is a difference in the ratio of coffee grounds to water. We measure coffee grounds by weight, and water by the fluid ounce. At the end of the day, coffee is simply the product of these two elements kept in contact over a period of time. Drip coffee ratios vary, but most brews are approximately 7 grams of coffee to 5 fluid ounces of water. 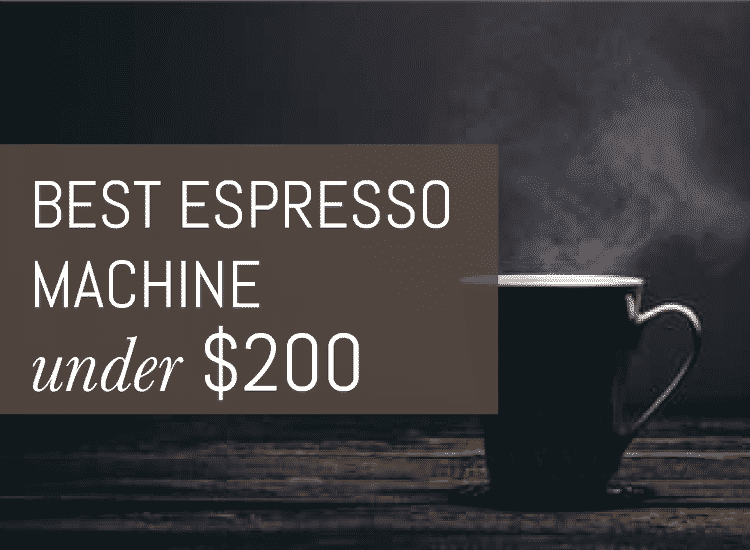 For a standard espresso, this ratio is generally 7 grams of coffee per 1-2 ounces of water, meaning that espresso has significantly more coffee by volume than drip coffee. So espresso is definitely more concentrated by the ounce, but that doesn’t necessarily mean that the beverage itself contains more caffeine. Remember that a normal-sized mug, or Starbucks tall, is a 12-ounce cup of drip coffee. According to our general ratio, that cup is going to have about 16.8 grams of coffee in it. That’s more than twice the amount of grounds in an espresso, and it is definitely a difference that you can feel. Caffeine in its natural state is a white and intensely bitter powder, and it occurs naturally in a variety of plants, including the two species of coffea plant where coffee beans come from. It is extracted from coffee beans when water passes over the grounds, similar to the way that flavor is extracted from tea leaves. Grind Size: This is a measure of how much surface area is available for the extraction process. The finer the grind, the more surface area is available to the water, which speeds up the extraction rate. Different brewing methods call for different grind sizes, but generally speaking, a finer grind allows more flavor and caffeine to be extracted over a shorter period of time. Roast: Coffee beans are roasted for varying lengths of time, and we classify roasts as either light, dark, or somewhere in-between. Contrary to popular belief, the roast of a bean does not significantly alter its caffeine content. On a similar note, the different sizes of beans are due to the fact that coffee beans expand the longer they are roasted. While roasting does significantly alter the taste of the final product, it does not do much in the way of chemically altering the beans themselves. Time: This refers to the length of time that the grounds are in contact with water. Like tea, coffee can be either over-extracted, or under-extracted. If not enough time is allowed for the extraction process to take place, the coffee can be sour and thin. If too much time is allowed to pass, the coffee will be overly bitter and dry. Coffee brewers try to use freshly roasted, evenly ground coffee beans that are extracted over an ideal period of time to make the perfect cup or espresso. It is difficult to give concrete numbers for the exact amount of caffeine in any given beverage, but by considering the general practices and factors as listed above, we can get in the ballpark. For espresso: A normal 2-ounce double shot should contain between 60 – 100 mgs of caffeine. For drip coffee: A medium-sized (12-ounce) mug of drip coffee should contain between 95 – 180 mgs of caffeine. So, for those days when you need a little something extra, it would be best to choose a larger portion of drip coffee over the espresso. If that still doesn’t cut it, most places offer a combination of drip coffee with an espresso poured into it. Just be prepared to be a little wired if that’s the case.